The Speed & Strength Ground and Pound Jacket is a 2-3 season warm weather retro inspired jacket. What’s not to like about that? The Ground and Pound jacket has an American fit and is offered in sizes SM-3XL. Black is the only color option. The jacket’s torso is constructed of 1-1.2 mm leather with 12 oz denim limbs. 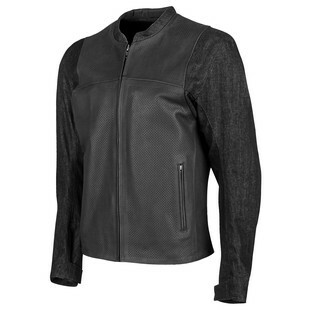 The leather vest-like design has perforation down the front and back to promote airflow. The outside of the collar and sleeve cuffs are denim with a microfiber lining to minimize irritation on your neck and wrists. The jacket comes with removable CE shoulder, elbow, and back protection. Additional features of the jacket include: YKK main zipper, napoleon pocket, mesh interior liner, conceal carry holster, 4 belt loops, waist adjusters, and reflective trim. Keep it classy, and keep it classic.